As we enter a new and busy ELAI membership year we would like to invite you to our first event: "GDPR - the HR Angle" to be hosted at the offices of KPMG, 1 Stokes Place, Dublin 2 from 6pm - 8 pm next Tuesday, 27 June. A panel of experts will discuss how employers, human resources practitioners, employment law practitioners and legal representatives can prepare employers for the introduction of the General Data Protection Regulation in May 2018. The event will be of interest to employment law practitioners, in-house counsel, human resources practitioners and employers preparing businesses for this landmark development in data protection law. Wine and canapés will be served after the panel discussion. On 12 May 2017, the Department of Jobs, Enterprise and Innovation will host a one day "Future of Work Conference" at Dublin Castle. Ministers Mary Mitchell O'Connor and Pat Breen and leading experts in the field will speak. Please note that our AGM will take place at 6pm at the Merrion Hotel on 26th April. On this auspicious week when Article 50 is triggered by the UK, I am delighted to announce that James Libson of the London law firm Mischon De Reya, who represented Gina Miller in the landmark Article 50 legal challenge against the British Government, will give a talk. Article 50 paragraph 1 states that “any member state may decide to withdraw from the Union in accordance with its own constitutional requirements.” Post-Brexit, the outcome of the Gina Miller case prevented the UK Government from triggering Article 50 without first being authorised by parliament to do so, in accordance with UK constitutional requirements. The case sparked controversy amongst the public, politicians and the media, provoking the “Enemies of the People” headline targeted at the UK judiciary. James Libson represented Gina Miller in this landmark case and will give an insider's account of the challenges faced by the legal team and will also discuss the aftermath of the decision on a national level. We have arranged canapes and a drinks reception for after the event and I look forward to seeing you all there! Our colleagues at the American Bar Association: Section of Labor and Employment Law will host a major international Midyear Meeting in the Westbury Hotel, Dublin from May 7 - 11 2017. The Midyear Meeting, hosted by the International Committee of the ABA Section of Labor and Employment Law will comprise a diverse series of presentations from leading international employment law and labour law experts. ELAI is proud to sponsor the opening of the conference with drinks Sunday evening 7 May at the Westbury Hotel. Justice Mary Laffoy our ELAI Patron will open the conference on the Monday 8 May. Topics will include Brexit, social media, data protection, cross-border employment and trade union recognition and restrictive covenants and a draft list of topics are attached. The meeting promises to be a globally-significant gathering of experts in the field. Full details and registration details for conference are available here. Non members of the ABA are welcome to attend the conference although a variety of membership options to join the American Bar Association are available here. The full programme of events is available here. We would encourage our members of ELAI to attend as it is a unique opportunity to meet employment professional not only from the US but across the EU who also attend such mid year meetings in what are fascinating times for lawyers in the US and lawyers in the EU and the UK with Brexit. The Employment Law Association of Ireland cordially invites you to its Annual Dinner 2016 with guest speaker and honorary members, which will take place in the Westbury Hotel, Dublin on 24 November 2016. Our Guest Speaker Paul Gilroy QC will talk on the fascinating topic of: Playing by the Rules – Tales from the Touchline as the Law of Employment collides with the World of Football. Paul Gilroy QC is a leading English barrister with a national and international reputation, principally based on his employment and sports practice. He has advised and acted for a sellar list of football clients; Sir Alex Ferguson, Roy Keane, Ryan Giggs, Martin O’Neill, Louis Van Gaal, Gianfranco Zola, Gary Neville and Sam Allardyce. Honorary Guests include: Our Patron, The Hon. Ms Justice Mary Laffoy of the Supreme Court of Ireland, The Hon Mr Justice Paul Gilligan of the High Court, Mr Kevin Duffy and Mr. Kieran Mulvey who in recognition for their contribution to employment law will be conferred honorary ELAI life time membership. Bookings: Purchase of tickets is by invitation through Eventbrite* please contact Danielle if you are not on invite list to purchase. We look forward to welcoming you at the Westbury. A survey of employment law and industrial relations practitioners by the Employment Law Association of Ireland on the two-tier workplace disputes system introduced last year by the Workplace Relations Act 2015 has identified significant problems with aspects of how the Workplace Relations Commission is operating. Substantial numbers of the 139 legal and industrial relations practitioners who responded are dissatisfied with the new system, with one in every two practitioners believing it is worse than the much-criticised, older version. The survey was covered by RTE News, the Irish Times and an opinion piece by ELAI Chair, Colleen Cleary was published in the Irish Examiner. The infographic below details the main results of the survey which was conducted by Dr Brian Barry, committee member of the ELAI and lecturer in law at Dublin Institute of Technology. • 49% of practitioners said that they were either dissatisfied or very dissatisfied with the new two-tier system, while just 31% said that they were either satisfied or very satisfied. 20% of practitioners said that they were neutral in this regard. • 48% of practitioners said that the new two-tier system is worse than the much-criticised and complex system for resolving workplace disputes that preceded the reforms under the 2015 Act. 34% of practitioners said that the system had improved while 18% said that system was neither better nor worse. 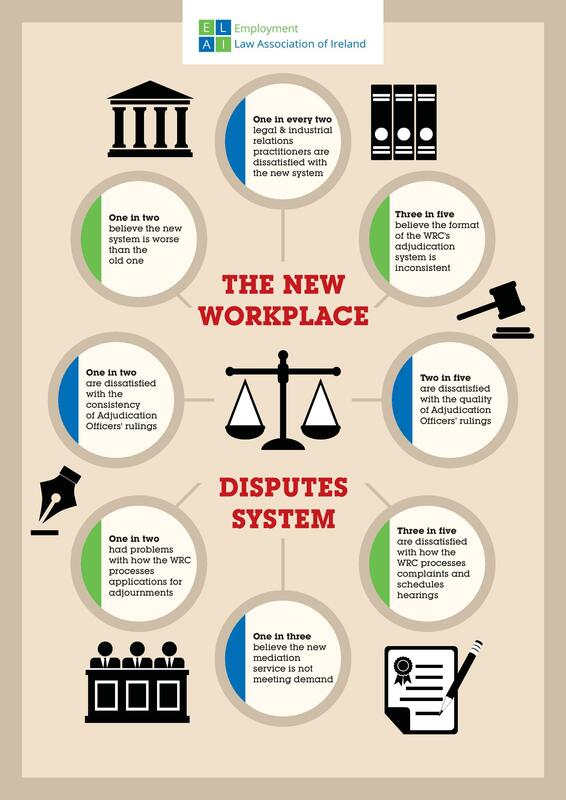 The Workplace Relations Act 2015 introduced a new Adjudication Service to adjudicate on workplace disputes in the first instance. Practitioners were asked for their views on this new service. • 40% of practitioners expressed satisfaction with the competence of Adjudication Officers at the Workplace Relations Commission, 30% were dissatisfied and 30% were neutral on this point. • 63% practitioners said that the format of hearings hosted by Adjudication Officers at the Workplace Relations Commission which are now held in private was not consistent from hearing to hearing. • 51% of practitioners were dissatisfied with the consistency of Adjudication Officers’ rulings. Just 18% said they were satisfied and 31% said they were neutral in this regard. The Workplace Relations Act 2015 introduced a new mediation service as a voluntary alternative to adjudication. • More practitioners (34%) expressed the view that they were dissatisfied with the availability of mediators than were satisfied (27%). Many practitioners commented that resources and personnel allocated to the service were insufficient to meet the demand for the new service, leaving many workers and employers without access to mediation. • 60% of practitioners expressed dissatisfaction with how the Workplace Relations Commission processed complaints and scheduled hearings. Practitioners were asked for their views on the revised Labour Court which now also hears appeals from decisions of Adjudication Officers at the Workplace Relations Commission. • 59% of practitioners expressed satisfaction with the competence of the Labour Court. Only 13% expressed dissatisfaction.